Spices 3 in Oakland, is one of the very few places we like to go to enjoy some spicy Szechuan food in Bay Area. 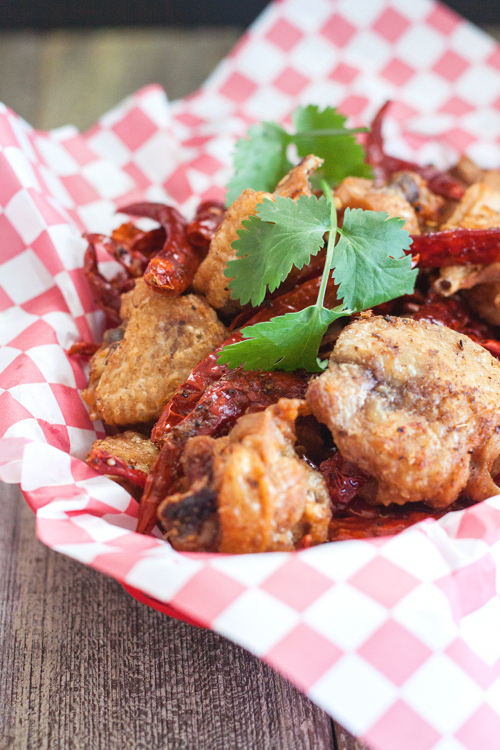 One of the dishes that we order almost religiously there is chicken wings with explosive chile. 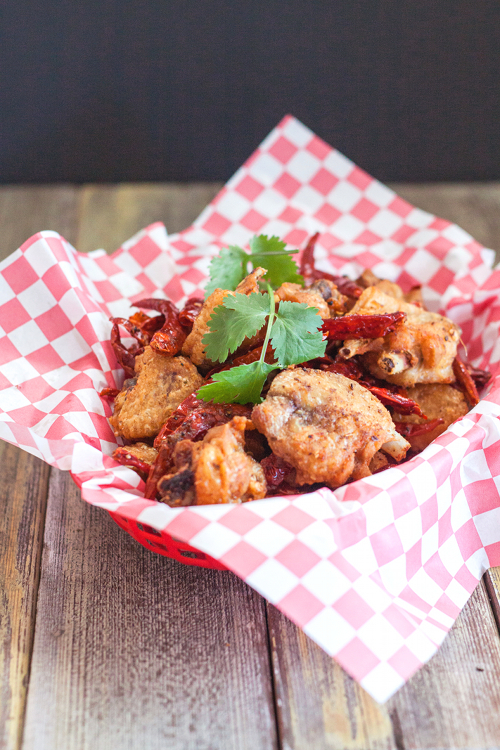 Crispy fried chicken wings dusted with spice and smothered in dried chile peppers is out-of-this-world delicious and we just can't get enough of this. Last week we went to this restaurant and after seeing my kids cleaned 2 orders of chicken wings in 10 minutes (and still begged for more! ), I decided that maybe it's time for me to make an attempt to replicate the dish. I don't want to dip into our retirement account only to satisfy my family's need for chicken wings! What do I know, I found this recipe from Chef Danny Bowien of San Francisco's Mission Chinese Food online and I thought I hit the jackpot! So today was the perfect day to do this. Rugby Sevens was playing and my family seemed to to have their eyes glued to the TV. A bucket full of spicy chicken wings, and everybody's as happy as clams. Pour 2 inches of the oil into a Dutch oven or large, heavy bottomed pot. Heat over medium-high heat until the oil reaches 300 F on a deep-frying/candy thermometer. Working in batches of 6 to 7 pieces, fry the chicken wings in oil, adjusting the heat as needed to maintain the temperature of 300 F, until the skin is opaque but not browned, about 3 to 5 minutes (the wings will not be cooked though). Using a slotted spoon, transfer the wings to a large bowl and toss with generous amount of salt. Place in a single layer on a baking sheet. When all of the wings are fried, let them cool completely. Cover the baking sheet and place in the freezer for at least 3 hours or overnight. Set the oil aside to use later. Meanwhile, heat the oven to 400 F and arrange the rack int he middle. Place the star anise, red pepper flakes, cumin, and peppercorns in a single layer on a baking sheet, and toast until fragrant, about 3 to 5 minutes. Let cool completely. Using the spice grinder or clean coffee grinder, grind into fine powder; set aside. Place the chiles in a single layer on a baking sheet and toast until slightly darkened and fragrant, about 3 to 5 minutes; set aside to cool. When ready to serve, set the reserved frying oil over medium-high heat and bring to 350 F on a deep-frying/candy thermometer. Working in batches of 6 to 7 frozen wing pieces, fry, turning the wings occasionally, and adjusting the heat as needed to maintain a temperature of 350 F, until the wings are cooked through, golden brown, and crispy, about 6 minutes. Immediately transfer each batch to a large bowl, season with salt and 1 teaspoon of the spice blend, and toss to coat. Place on a serving dish and repeat with the remaining wings. When all the wings are cooked, place the reserved chiles, ginger, 1 teaspoon of the spice blend, and 1 tablespoon of cooking oil in the large bowl and toss to combine. Scatter the mixture over the chicken wings and sprinkle with cilantro. Serve immediately. 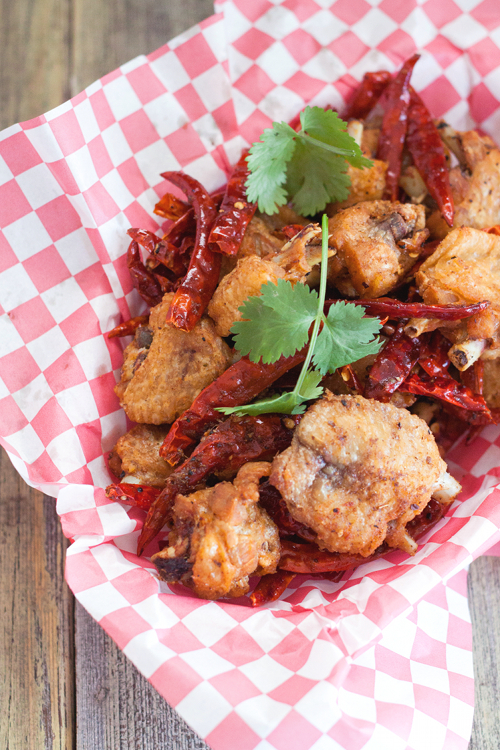 This is one of my favourite Szechuan chicken dishes! Thank you for posting this recipe! I will try it soon.